This summer, spin to win during this new Pennzoil Sweepstakes. 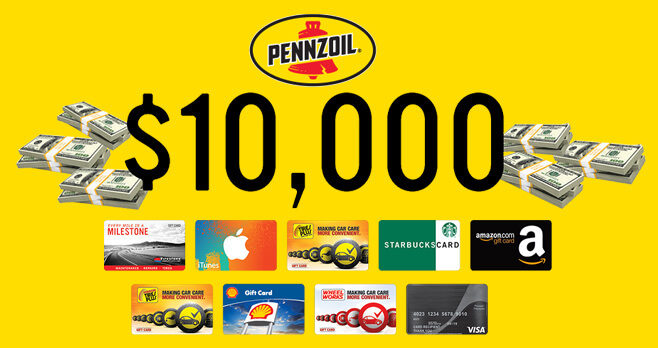 Go to pennzoil.com/spin and register for your chance to win the $10,000 grand prizes or one of thousands of gift cards from VISA, Amazon, Shell, Starbucks, iTunes and more. Over $660,000 in prizes. Ends: 11:59 P.M. CT on July 31, 2018. Prizes: The grand prize consists of a $10,000 Check. Other prizes include Visa Prepaid Reward Cards, Amazon.com Gift Cards, BSRO Store Gift Cards, Shell Gift Cards, Starbucks Cards, and iTunes Gift Cards. Eligibility: The Pennzoil and Bridgestone Spin to Win Promotion is open only to individuals who are legal residents of and currently residing in one of the 50 United States of America (or the District of Columbia), excluding U.S. territories or possessions and are at least 18 years old at the time of entry.